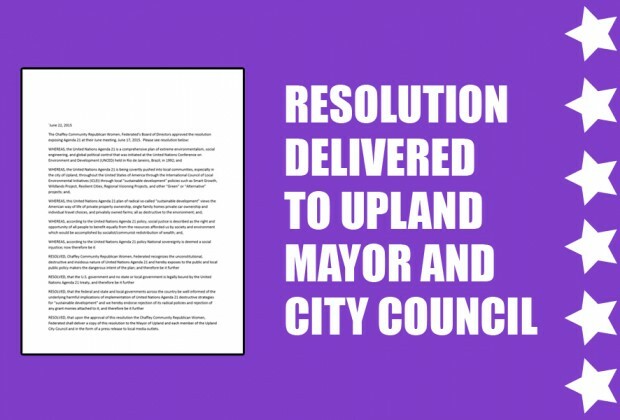 The more than 100-member Chaffey Community Republican Women, Federated was represented at the Upland City Council meeting last night by member Diane Fedele who presented a resolution to Mayor Musser and the City Council which exposes Agenda 21 to the public and identifies the new Upland General Plan and its components as written to align with it. 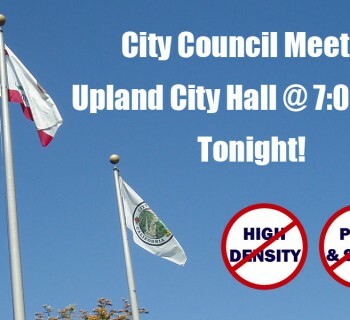 The "resolution" (click here to read it) describes the destructive strategies for "sustainable development" and states the group's opposition to Agenda 21 and the Upland General Plan. Previously, the National Republic Party, the Republican Party of California and the Republican Party of San Bernardino all approved similar resolutions and sent them to all public officials, mayors and governors nationwide. Chaffey Community Republican Women, Federated is a sixty-five-year-old organization of registered Republicans, fifty of whom live in Upland. They are charted to serve Alta Loma, Montclair, Ontario, Rancho Cucamonga and Upland and the national main body is the largest organization of volunteer women in the country. "We reject its radical policies and reject any grant monies attached to it," stated Fedele. The resolution will also be sent in the form of a press release to local media outlets. Hooray for Republican Women for standing up for freedom! !